Initially depicting Saints and symbolic imagery of workers and royalty, todays patterns run the gamut from ethereal clouds to dramatic pop art, natural grass cloth to vinyl 3-D prints. There are also companies that specialize in letting you create your own design while they print it. This is no longer the era of your grandma’s floral border. 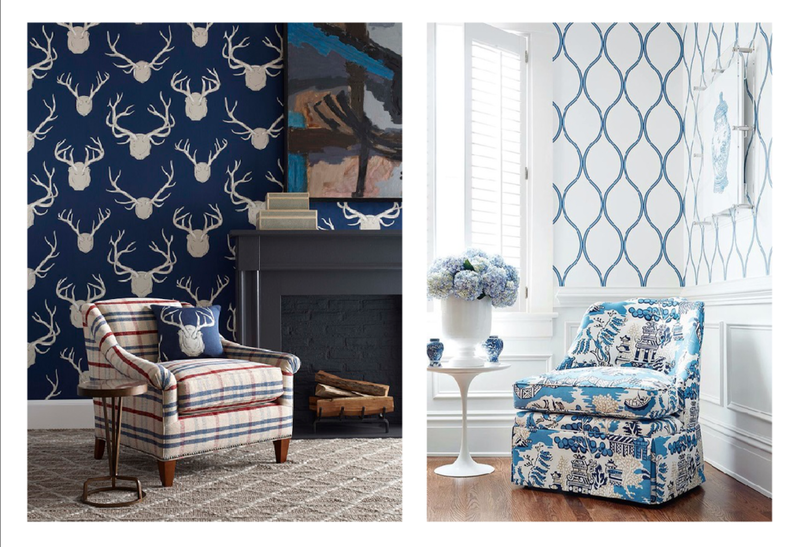 Wallpapers are meant for every room, every age, and every surface. Walls, ceilings, floors, furniture- they all take on new character and vibrance. Glamorize ceilings, create drama for a powder bath, instill calm into a bedroom, create whimsy in a nursery. Don’t be shy when making selections. Wallpaper is a work of art. Go ahead and give a hug to flamboyant and oversized geometrics in your front hall, collections of dogs in your mudroom, etched clouds on your master bedroom ceiling. Evoke a taste of yesterday with vintage wallpapers from the midcentury modern era or simply give a room some needed interest with 3-D abstracted textures. Before making that final selection, be sure to see an actual sample of the paper in your environment it will be installed in. Colors can change with various lighting scenes. Be sure to consult an installer for an exact amount you will need. Pattern repeats and varying roll sizes are not easily calculated by the old school equations for measuring. Be sure the paper type (natural fiber, paper, vinyl, etc.) is appropriate for your lifestyle use and function of the space. For example: A grass cloth in a bathroom that gets a lot of splashing would not hold up well. Try vinyl instead. While paper can be applied over plaster, paneling, old wall paper, or tile, be sure it is the right paper type to perform over these unusual sub-surfaces. Consult with your local design professional or installer for advice.